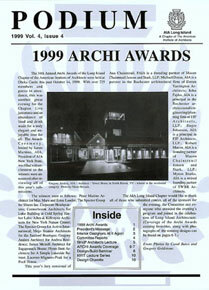 The 34th Annual Archi Awards of the Long Island Chapter of the American Institute of Architects were held at Oheka Castle this past October 14, 1999. With over 225 members and guests in attendance, this was another great evening for the Chapter. Live jazz music and an abundance of food and drink made for a truly elegant and enjoyable time for all. The Awards Ceremony, hosted by James Martino, AIA, President of AIA New York State, was filled with excitement as the winners were announced after reviewing all of this year’s submissions. The winners were as follows: Peter Marino Architect for Max Mara and Estee Lauder; The Spector Group for Sbarro Inc. Corporate Headquarters; Centerbrook Architects for Luke Building at Cold Spring Harbor Labs; Allen & Killcoyne Architects for New York Nature Center; The Spector Group for Active International; Mojo Stumer Architects for the Sanford Boutique; Gregory Andrea Architect for Andrea Residence; James Merrell Architect for Sagaponack House; Flynn-Stott Architects for A Simple Lakeside Retreat; Lacroze-Miguens-Prati for a Pool House. This year’s jury consisted of Ann Chaintreuil, FAIA is a founding partner of Macon Chaintreuil Jenson and Stark, LLP; Micheal Doran, AIA is a partner in the Rochester architectural firm of Doran Yarrington Architects; John Fayko AIA is a principal in the Rochester architectural/engineering/planning firm of FJF Architects, LLP. 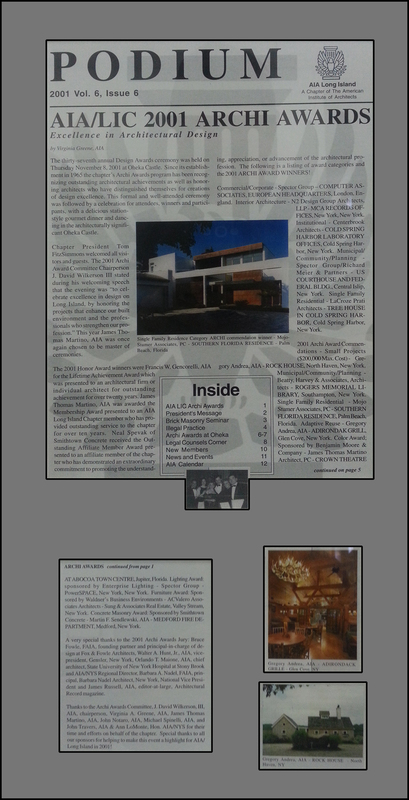 ; Roger Johanson, AIA is a principal in FJF Architects, LLP. ; Robert Macon, AIA is a founding partner of Macon Chaintreuil Jensen and Stark, LLP. ; Myron Starks, AIA is a retired founding partner of SWBR Architects. Finally someone has it figured out – exactly what we need to accommodate our changing lifestyles for the 21st century, with style. The architectural firm of Greg Andrea and Richard Baker designs wondrous spaces for living, working, dreaming and being that bring practicality, aesthetics and environment to a harmonious resolution, regardless of budget. “Whatever the design parameters are, Baker and I strive for solutions that are appropriate for the site as well as recognizing and intelligently utilizing the existing vernacular,” says Greg Andrea. Their architecture, both internally and externally is about “creating a mood – be it inspiration or wonder.” A walk through one of their creations is like floating through a dream of Venice. Each corner turned finds surprises like grottos, towers, and delicate wire bridges, all of which intertwine the sprawling spaces to create an entity that is whole and coherent, yet separated enough so that you can enjoy your family and guests while finishing that last great Pulitzer Prize-winning scene or the first movement of your very first symphony. Details like breezeways, loggias, and pergolas, circular windows peering out over interesting niches in the design, birdhouses covering vents and copulas atop stone fireplaces reminiscent of seaside towns of yesteryear, are trademarks of Andrea & Baker homes designed especially for the Hamptons. 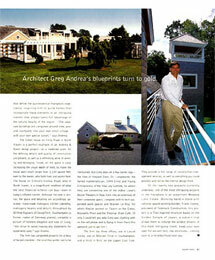 Spending his childhood summers in the Hamptons has given Greg Andrea a remarkable sensitivity to the range of images that define the quintessential Hamptons experience, inspiring him to build homes that incorporate these elements in an intriguing manner that always takes full advantage of the natural beauty of the region. “The separate buildings are composed around view, pool and courtyard, like your own small village – with your own special sunset,” says Andrea. The Cohen house on Ferry Road in North Haven is a perfect example of an Andrea & Baker design project – on a moderate scale. All the defining details and quality of construction are present, as well as a refreshing sense of serenity and belonging. Inside, all the space is used, increasing the visual depth of field, to make the house seem much larger than 1,100 square feet, even to the owner, who both lives and works here. The house on Ezekiels Hollow Road, also in North Haven, is a magnificent rendition of what the next financial echelon can buy – even in today’s inflated market. Although the tone is similar, the space and detailing are accordingly up-scaled. Hand-made mahogany kitchen cabinetry, mahogany beams and details throughout by Wilfred Bayrami of DesignTech, Southampton (a former maker of Steinway pianos), complete a picture of timeless elegance and ease of living. “We strive to avoid making any statements for statements sake,” says Andrea. The firm has three offices; one in Locust Valley, one on Mariner Drive in Southampton, and a third in NYC on the Upper East Side. They provide a full range of construction management services, as well as everything you could possibly wish for on the interior design front. Of the twenty-two projects currently underway, one of the most intriguing projects in the Hamptons is an oceanfront Meadow Lane Estate. Working hand-in-hand with national award-winning builder Frank Dalene, president of Telemark Construction, this project is a Thai-inspired structure based on the Golden Temples of Japan, a subject that allows them to indulge the wildest dreams of this most intriguing client. Keep your eyes open for ancient relic-like strictures – coming soon to a neighborhood near you. This award winning neoclassical shingle style home is the perfect living space for life in the new millennium. Winner of the Long Island Chapter of the American Institute of Architects Archi Award for the best single family residence, the North Haven home is made up of separate buildings that are joined by bridges and breezeways. “It’s broken up into many different parts. 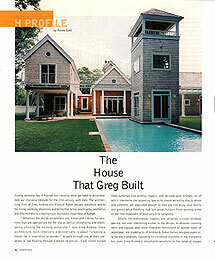 Each part has a different function,” said Gregory Andrea A.I.A., who designed and constructed the house. “The different elements create a village-like atmosphere that’s centered around the pool. The house is woven into the environment. Every window in the house was strategically located so that you would have water views,” he said. Called “The Tower House,” the five bedroom and five bathroom residence features a guest wing completely separated from the master bedroom suite, making the house a perfect place to entertain with privacy. The master suite clearly represents the lifestyle of the 21st century with its sitting room/study that allows a couple to function independently while still being in close proximity. “We are centralizing, we are moving out of the cities, we are able to do our work from our house,” Andrea said. A tower that connects to the master bedroom suite is a focal point of the 3,000 square foot masterpiece home. Boasting an all glass pool room that reflects the water and a spiral staircase leading to the upper level, Andrea calls the tower a “lyrical element” of the home. “My architecture is about you viewing out a window and seeing other parts of the house. When you’re in my house, you’re in a theater of architecture. My architecture is not about a rectangular box, it’s about creating space. “Every room in “The Tower House” has an open ceiling with beams and lofts and the entire house is done in handmade mahogany by DesignTech of Southampton. The great room has a large cupola featuring an electronic window that opens for natural ventilation. Andrea pays close attention to every aspect of his works. “Every little detail is touched,” he said, describing vents designed like wooden birds houses, chimney tops adorned with cone shaped or pyramid shaped caps, and loggias and pergolas. This spectacular home actually includes a stone cave grotto that goes under the house and features a mahogany wine cellar. Gregory Andrea A.I.A creates his architectural works out of his office headquarters in Locust Valley and from two other offices, one in Southampton and the other New York City. Each design includes a clay model that’s fired and shows the house to scale. Like a spring of water that only hints at its underneath reserves, the creativity of Locust Valley architect Gregory Andrea seems to have an endless source. Consider, for example, his many architectural awards (one in each of the four out of five years) as well as the ease with which he created this charming North Shore home. It was an unusual project for Andrea, who leans towards modernism in his buildings. Certainly, he explains, elements of his “rationalist” architectural style are found in everything he creates. However, because the owners wanted something more historical, in taking this on, he would be veering away his trademark specialty. Classifying the finished 7,800 square foot home as “arts and crafts style” as well as “rationalized Adirondack,” the architect and the homeowners are delighted he took this different direction. 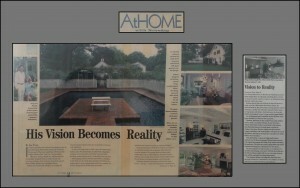 The result, they all agree, is a home that fits beautifully in its surroundings as well as in the heart of its owners. The homeowners who brought him this project jokingly describe themselves as “refugees” from the tight living spaces of Manhattan. Having just purchased a rather plain ranch on two lovely North Shore acres, they had a few requests. They wanted a sense of history in the finished project. 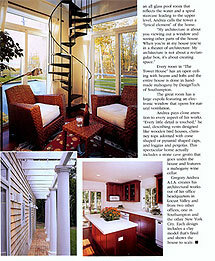 Preserving the rich wooded landscape was a priority as was ending up with a home that was comfortable and spacious. They had lived cramped. Andrea would offer them room to breathe in an atmosphere of artful flow and function. It is reported that an earlier Long Island resident, Teddy Roosevelt, believed that the Adirondack style, which its roots in Swiss architecture, best harmonized manmade structures with a wooded landscape. And since Andrea’s rationalized approach incorporated some of those elements, Andrea seems to agree. The finished structure hints of upstate New York lodges and challets and the harmony with which they fit in their environs. Pragmatic as he is creative, Andrea also fills the role of construction manager on his projects when clients want this service. The building process is a big undertaking, he explains, and clients not only find it easier to have one hand guiding it all, but they also discover it can be cost-effective. Andrea’s design for this project required knocking down the ranch entirely, keeping only elements of the original foundation. A master craftsman, Ted Selmer, was brought on board and Andrea and company began building the new house. However, to Andrea, a home is much more than building materials and a group of rooms. Emotion he stresses is an important element of his work and he loves creating feelings of brilliance, mystery and wonder. To Andrea, this is true escapism, something as necessary as the elemental functions of a home. Visitors to their finished home are quick to notice other artful details. The great room’s vaulted ceiling, for example, at 32 feet high leads into a beautiful cupola. The entrance way is also striking. Visitors are greeted at once with both intimacy and expanse. “I like to tighten in the architecture as you access a building and then open it up as you enter. Also, the function should create beauty. We didn’t add extra details for the sake of adding design. Everything has a purpose and flows functionally,” says the architect. But never veering too far into function to neglect emotion, Andrea’s smile broadens when pointing out the balconies and porches – so important to his designs. Indeed, bringing the inside out and the outside in, trademarks of Andrea, are in full evidence here, he explains. Gregory Andrea A.I.A. 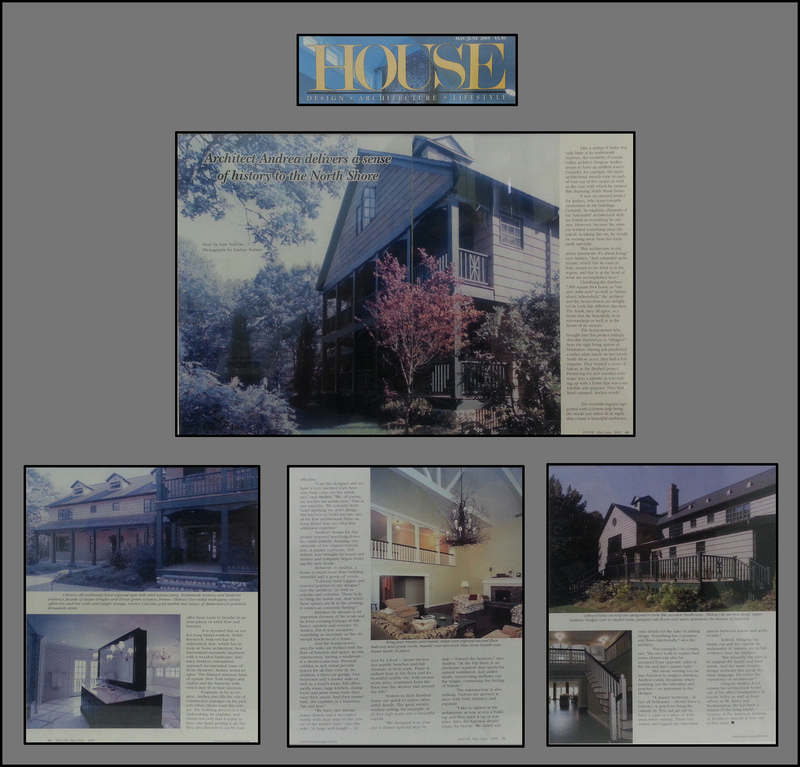 creates his architectural works out of his office headquarters in Locust Valley as well as from offices in Mt. Kisco and Southampton. 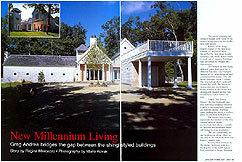 He has been a winner of the Long Island Chapter of American Institute of Architects Awards in four out of five years. Call it new tradition. Tradition with a personal touch. A house that doesn’t scream how big it is but unfolds with more than ample space for a family with kids, dogs, antiques and all the modern creature comforts. That’s the style house that comes into view at the end of a gravel driveway on a 2-1/4 acre lot in Lattingtown, where architect Gregory Andrea and homeowners Clark and Kendall Graebner transformed a 1970s-era ranch into a gracious Colonial. They grafted a second story and 4,000 square feet of space onto a 2,200-square-foot three-bedroom first floor. Gray-shingled with white trim, the new house has roof gables that are more sharply pitched than the original and windows that are a mix of traditional restraint and distinctive round statement. It embraces the round loop of the driveway and rambles just enough to suggest what’s inside. The renovation, largely completed two Christmases ago, was not the first to transform the simple ranch. The family had updated the kitchen and added a cathedral-ceilinged family room, a laundry room and a two-car garage after they moved in eight years ago. “They began knocking down the carport when I brought my son home from the hospital,” recalls Kendall Graebner, 37, an equestrian jumper from Cold Spring Harbor who has worked in design and is daughter of the longtime publisher of Architectural Digest, the late Thomas Losee Jr. The number of bedrooms went from three to five, with each having access to a private, or seldom-shared, bathroom. An attic-level playroom now opens onto an interior balcony-loft in the second-floor master bedroom. That bedroom, under a 20-foot ceiling, has become the new favorite spot for Clark III, 8, and Skyler, 4. A plasma screen television hangs over a gas fireplace, and a big tub in the master bathroom, tiled in tumbled marble, is heaped with Skyler’s toys. Architecturally, the room is striking. A large windowed cupola tops the cathedral ceiling. On the tallest outside wall, French doors leading to a balcony are set amid three large round windows. Above the bed is a balcony loft, where a library might go. It was an epiphany for architect Greg Andrea when he saw the frumpy old building locals call the Flower House, part of the once magnificent Old Brookville estate of former New York Gov. Nathan Miller.“The place really grabbed me,” Andrea said. He immediately imagined how he could renovate the two-story building, which had once housed the estate’s farm workers upstairs and equipment below.Andrea, 43, and his wife, Michele, 34, bought the two-acre property three years ago, its grounds overgrown with vegetation.“It was a kit house built in 1910, very well constructed,” Andrea said. “We found beams marked with calligraphy numbers, and in the attic everything was beautifully finished, sanded and doweled; it looks like a boat up there. Using period features of the Flower House as leitmotive, he replicated details such as exposed rafter tails and oversize shingles. The garage, pool and cabana exist comfortably with covered walkways, decorative fences, trellises, and a bridge that connects the second floor of the Flower House to the guest quarters over the garage. Andrea says it took only 30 days for his work crews to make over the 1,600-square-foot Flower House. He removed walls on the ground floor, leaving only the central staircase, a creaky but authentic remnant of the times past. 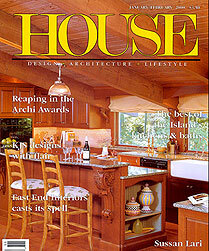 Living spaces, including a sheltered patio, fan from the kitchen he designed around a large marble-topped island. An old-fashioned porch stretched across the front of the house shaded by a 100-year-old sycamores. From the balcony, an open-air bridge leads to guest quarters over the three-car garage. Wisteria vines twine the 4-by-4 posts that support the bridge, leafy curtains that drape the pathways. The path veers under a grape ardor and around a square swimming pool, widening in front of a cabana. One final segment of Andrea’s plan is a building to be used for entertaining. A courtyard will link the building to the Flower House, which will live up to its name because part will be converted to a plant conservatory. After more than two decades as an award-winning designer/builder of high-end residences and commercial structures from the Hamptons to Manhattan and beyond, Andrea was eager to try something new. 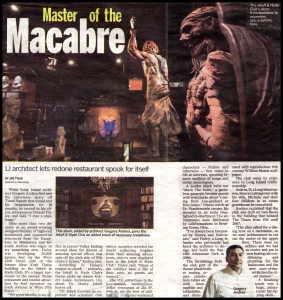 Finley was developing 25,000 square feet on the West 44th Street side of the former New York Times building as the Jekyll & Hyde Club. 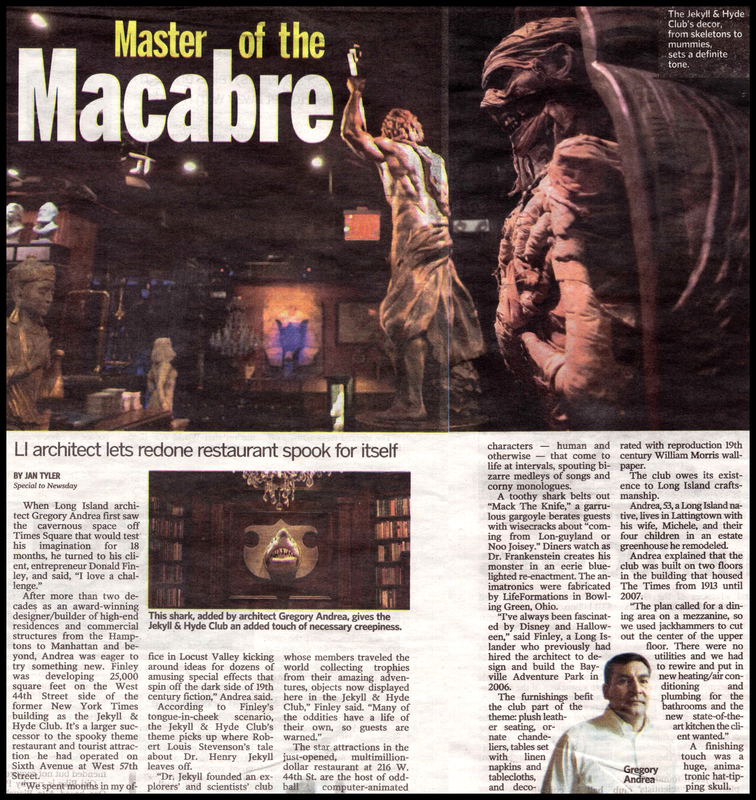 It’s a larger successor to the spooky theme restaurant he had operated on Sixth Avenue at West 57th Street. “We spent months in my office in Locust Valley kicking around ideas for dozens of amusing special effects that spin off the dark side of 19th century fiction,” Andrea Said. According to Finley’s tongue-in-cheek scenario, the Jekyll & Hyde club’s theme picks up where Robert Louis Stevenson’s tale about Dr. Henry Jekyll leaves off. The star attractions in the just-opened, multimillion-dollar restaurant at 216 W.44th St. are the host of oddball computer-animated characters – human and otherwise – that come to life at intervals, spouting bizarre medleys of songs and corny monologues. A toothy shark belts out “Mack The Knife,” a garrulous gargoyle berates guests with wisecracks about “coming from Lon-guyland or Noo Joisey.” Diners watch as Dr. Frankenstein creates his monster in an eerie blue lighted re-enactment. The animatronics where fabricated by LifeFormations in Bowling Green, Ohio. “I’ve always been fascinated by Disney and Halloween,” said Finley, a Long Islander who previously had hired the architect to design and build the Bayville Adventure Park in 2006. The furnishings befit the club part of the theme: plush leather seating, ornate chandeliers tables set with linens napkins and tablecloths, and decorated with reproduction 19th century William Morris wallpaper. The club owes its existence to Long Island craftsmanship. Andrea, 53, a Long Island native, lives in Lattingtown with his wife, Michelle, and their four children in an estate greenhouse he remodeled. A finishing touch was a huge animatronic hat-tipping skull. The proposed Waters Edge inn in Bayville envisions a four-floor, 14,273-square-foot, 23-room hotel with a restaurant and bar overlooking the Long Island Sound. Developers of a proposed seaside inn in Bayville said they hope to reschedule a public hearing for this month or June after it was postponed in March. Town. The development would include on-site parking and additional parking across Bayville Avenue. Before it can be built, the project needs to have zoning variances approved, according to the plans filed at Village Hall, as well as Nassau County approvals, Bayville Mayor Paul Rupp said. The now vacant property is owned by Leonard Gross of Oyster Bay Cove, who has an agreement to sell the site to Euroamerican Funding Group LLC — if it receives all the approvals needed to allow any construction, Andrea said. Public records show Euroamerican is registered to the Westchester address of Manhattan lawyer William B. Wachtel, who also signed financial documents filed with the county on the company’s behalf. Wachtel did not respond to queries this week. Rupp, who supports the project, said developing the property would boost village tax rolls and help its finances. Audited financial statements show that from 2012 to 2016, the village’s revenue growth outpaced spending growth. “Bayville needs a change and needs a face-lift, and it would definitely be a financial incentive for the village because it would increase the tax revenue,” Rupp said. But Village Trustee Michele Principe said the inn’s size would be out of character for Bayville. The village’s zoning code restricts buildings to two and half floors for residential structures and two stories for commercial properties. “The building is too big, not what we want in Bayville,” Principe said. “It’s going to bring in a lot of traffic into a small-volume town — we only have two lanes.” She said she was also concerned about its septic system’s impact on the environment. Andrea said the project’s sanitary systems was being designed and engineered to meet village and county codes. Rena Bologna, 67, a retired assistant schools superintendent and president of the group Save Bayville Now, said she believes the project is a Trojan Horse to put in condos. “My biggest concern is that when it doesn’t work . . . then we’re going to be stuck with another monstrosity and then they can go to court and claim a hardship case and get multiple dwellings in there,” Bologna said. Andrea said the building is being designed as an inn and “as of today there is no plan” to convert it to condos. Bayville Chamber of Commerce president Vincent Moscato said the project would help local businesses. “You’ll have a place for people to come and stay here when they have weddings,” Moscato said.